Renny Harlin's new film explores the strange deaths of nine young hikers in northern Russia in 1959, bringing this cult incident into the mainstream. The outcome is unlikely to delight audiences. They only found five to begin with. Yuri Doroshenko and Yuri Krivonischenko, stripped to their underwear, were lying by a cedar tree a mile down the slope from their abandoned tent. The group leader, Igor Dyatlov, dressed but shoeless and with non-matching socks — wool on the right foot, cotton on the left — was lying face down in the snow, hugging a birch branch, 300 yards from the cedar tree on the way leading up to the tent, with his head pointing in that direction. Another 300 yards further up lay Zina Kolmogorova, also pointed headfirst towards the tent and shoeless. Even higher up, 180 yards from Zina's body, was Rustem Slobodin: fractured skull, felt boot and four socks on the right foot, nothing on the left. The others were only found two months afterwards, in late spring. Lyudmila Dubinina was found kneeling beside a stream. Nearby lay Semyon Zolotarev and Alexander Kolevatov, embracing each other, and there in the water was Nikolai Tibo-Brinyol. Zolotarev's eyes and Dubinina's eyes and tongue were missing. Those who saw the horrific scene also mentioned the strange color of the victims' skin – it was a reddish-orange hue. It was the Soviet Union in 1959. No newspaper covered the incident — there were no words to describe such things. Besides, in those days no one turned to the press to find out what was really going on. Rumors, urban legends, and the grapevine were the media of the Soviet people. The funerals were attended by practically the whole of Sverdlovsk (now Yekaterinburg), where the nine were students. Over the decades before the first online forums appeared on the Russian Internet (Runet), stories of the tourists’ terrible demise, interwoven with generous helpings of both fact and fiction, were passed down by word of mouth from one generation to the next. It is important to remember that tourism – travel just for fun – was in its infancy in Russia at that time and trips were associated less with snapshots against an interesting backdrop and more with romantic trips into the wilderness with backpack, tent, and guitar in tow. 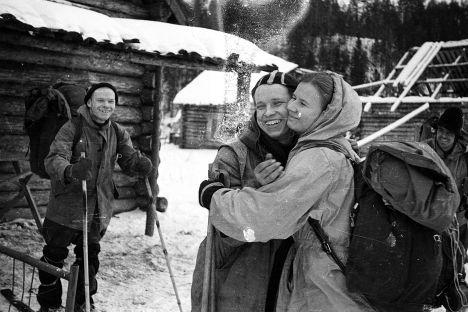 For several generations of these kind of hikers and backpackers, the tale of Dyatlov and his comrades became the first to send a tingle and shudder down their spines as they huddled around a campfire. The pass on the slope where the tourists met their fate was named after Igor Dyatlov. Enthusiasts have since erected a memorial at the site. In the 1990s, when the restrictions on newspapers were lifted, Lev Ivanov, the lead investigator on the case who in 1959 had dismissed it with the phrase "death was caused by an elemental force that the victims could not overcome," managed to give some interviews. In them, he hinted that this "elemental force" had signs of the paranormal: a UFO, Bigfoot, or something in that vein. Naturally, Ivanov's archive was the main source of documentary evidence in the Dyatlov case. Throughout the hike, the group members had kept diaries and taken photos, all of which were put in the file. Eventually, the full photographic archive entered the public domain. Staring out of the images were cheerful faces, old-fashioned gear, and the spectacular scenery of the Northern Urals — mountains, snow, and more snow. There never was, and never will be, an official version of events, but as in any mystery, there are skeptics who take pleasure in eliminating the supernatural. Northern locale, snow, winter — it's obvious they were hit by an avalanche or snowfall that buried the tent. Panicking, they dashed outside half-dressed to meet a frozen death. But what if it wasn't caused by snow? They were camping in a cold lifeless region about which no real facts exist and which could have been the site of a Gulag camp, a secret nuclear facility, a testing ground for unknown weapons, or just an enchanted nature spot. The indigenous Mansi people, who inhabited this area long before the arrival of the Russians, called the mountain pass Nine Dead Men Mount, the same number as in Dyatlov's group. This creepy tale with far more questions than answers makes for a classic horror story. The story is also influenced by the long and fierce debates that have been raging on the Runet, first locally, then across the Urals, and then in Moscow. There have been multimedia presentations that include photographs from the group archive with eerie electronic music in the background, as well as articles by popular detective writers and books by unknown enthusiasts who have devoted years to a detailed study of that fatal excursion. "Dyatlovmania" is one of the Runet's most striking phenomena. And now that phenomenon has become a Hollywood film, entitled “The Dyatlov Pass Incident” by director Renny Harlin. For Dyatlov fanatics, Harlin's film will, of course, be a travesty, but they will never admit, even to themselves, that the fault lies not in the movie, but in the inevitable transformation of a local cult into a commonplace narrative. No one likes it when avant-garde becomes pop, but other criteria for a "neat story" seem to be lacking.